If you’re using either of these methods you’re not alone. In fact, most restaurant managers we speak with are still using one of these methods to create their employee schedule. Although there are other options available to help streamline the process, many people continue with this approach for one of 2 reasons: Either they’re averse to change or because that’s the way it’s always been done. And that’s fine...if you’re writing a restaurant schedule for a 3-5 person operation. It’s fast, it’s free and it gets the job done. But, like anything in life, time evolves and tasks get more complicated. Now instead of just writing a schedule you have to consider labor costing, payroll tracking, taxes, holiday/stat pay and other items. What was a simple schedule now turns into something far more complex and time consuming. And if all of these things are not taken into account, profitability suffers and it becomes harder to run a successful restaurant. The good news is that as time goes by technology continues to evolve. Nowadays there are a number of options to help save time and reduce the challenges managers face in creating schedules. Today we’re going to take a closer look into 3 available options, and help you understand the differences between them. If you’re familiar with Microsoft then you’re likely familiar with their spreadsheet program - Excel. If not then maybe Google Sheets, Numbers for Mac, or some other spreadsheet program. With the explosion of computer usage in the late 90’s, using spreadsheets to help manage and organize information became very popular. Excel was the preferred program to do so. Now nearly 20 years later spreadsheets are still popular and used throughout restaurants to help manage things like liquor counts, inventory, payroll tracking and of course employee scheduling. Everyone knows how to use spreadsheets. If you don’t, it’s easy to teach - simply click in a cell and type what you want. Pretty straightforward, even for someone with limited knowledge of using a computer. Excel comes pre-bundled with the entire suite of Microsoft business products called Microsoft Office. Basically you pay a one-time fee that gives you access to the latest version, typically released every 2-3 years. Although you can now buy Excel separately, if you are still using the program do yourself a favor - switch to Google Sheets. It's easier to use than Excel, gives you the necessary features, and it’s completely free. Raise your hand if this has ever happened to you. You’ve scheduled too many people for the same shift - or – you accidentally forgot to schedule a person for a shift altogether! With no error checking these types of errors can and do happen. The challenge is that in either case you’re making your staff or your guests unhappy. Neither of which are good for running a successful business. If you’re creating the labor budget for your employee schedule in Excel, you’re playing with fire. If another person accidentally changes a formula without you knowing it, there can be serious problems with over or under-spending on expenses. The end result: kiss profitability goodbye. How many people are responsible for updating your schedule (for things like shift changes, time off, etc.)? The more people with their hands in the cookie jar the more chances of problems arising. For example, not the right amount of people to fill the shift, unbalanced floor-plans with varying skill levels, etc. In addition, if the document is being shared, understanding who has the master version can be somewhat difficult to track if you don’t have a proper process in place. Remember the good old days where POS systems had complicated sheets or key codes to punch in orders (Remenco, IBM, etc.). These days most restaurants have touch screen systems that fast track guest ordering to the kitchen in a fraction of the time. Many of these systems do more than just assist guest ordering and can include additional capabilities such as inventory control, HR management and employee scheduling. POS solutions that include an employee-scheduling component will have some level of integration with other modules of the POS. For example, some systems will enable the ability to house information about an employee including their regular weekly availability, wages, and past payroll punch times. The system can then use the information to help compare actual vs. budgeted labor, produce reports for payroll processing, and other functions that reduce the time involved with workforce management. Depending on the POS solution, some providers offer scheduling capabilities at no added cost to the overall price of the solution. The primary function of a restaurant POS system is to streamline the processing of guest orders to and from the kitchen. Although many systems come with added options (e.g. inventory, HR, scheduling, etc. ), any additional components tend to be fairly basic in nature. Scheduling functionality that comes pre-bundled with most POS systems tends to be less user friendly than other scheduling software options out there. Back in the 80’s/early 90’s when everyone started buying personal computers, all software used was directly installed onto the hard drive. Fast-forward to today and you’ll see that most software is now delivered online. This dynamic shift has taken all software that we traditionally installed on our computers, and put it up in ‘The Cloud’. 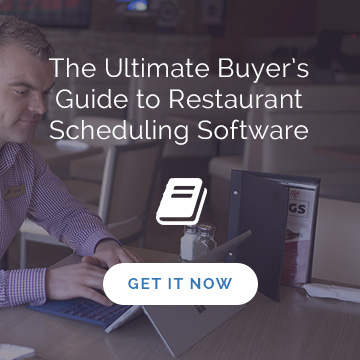 Restaurant scheduling software is no exception. Water. Heat. Electricity. These are basic services that are available nearly everywhere. Ask anyone and they’d probably say we can also add the Internet to that list. Reason being, over 7 Billion people in this world have phones, many of which are smartphones that have access to the Internet. With that kind of reach, online scheduling provides the ability to access your schedule information wherever you go. A very convenient benefit for restaurateurs wanting to keep an eye on things when they're not at the store. Most online software companies offer products via monthly subscription plan with no long-term contract commitments. The advantage is that if you're not happy with your provider you can change fairly easily. In turn, providers must always be improving their offerings to maintain favor in the marketplace. The advantage to restaurant owners is that they gain access to a product that is constantly providing added value without having to pay an increased fee. 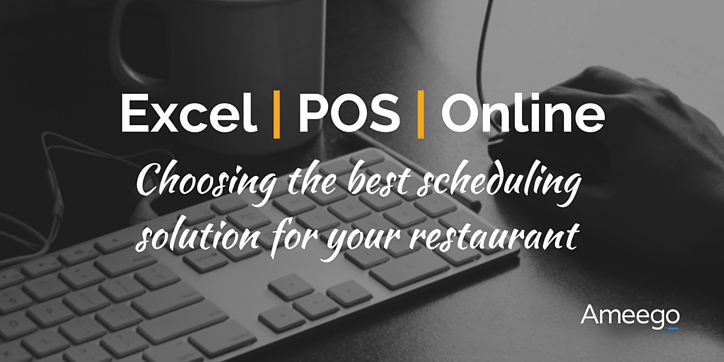 As reviewed earlier, Excel and native POS scheduling options are limited in terms of the features and value they can provide. Remember...you get what you pay for. The primary reason for working with an online restaurant scheduling solution is the added value received by paying for the service. 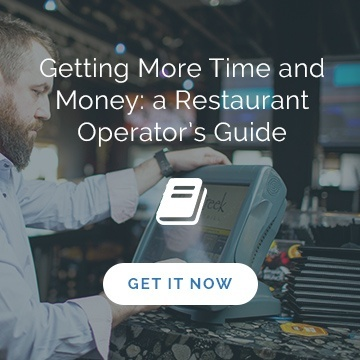 Restaurant scheduling companies like Ameego provide a number of additional tools to help generate a better Return-On-Investment (ROI). Some examples include integrations with Point-of-Sale (POS) and payroll processing companies, advanced labor budgeting/automated scheduling, and self-service employee portals. Not to mention better customer service and support. As its name suggests - it’s online scheduling software, meaning that in order to work you need access to the Internet. As I mentioned earlier, one of the advantages to being online is the ability to have access wherever you go. Online scheduling becomes a challenge when you can’t find the Internet or if you have a spotty coverage. Something to be kept in mind if you like working off the grid. How to decide which is best? Excel and Native POS solutions have minimal cost, but how much do their short comings affect the value? Does the benefit of paying for an online solution outweigh the cost? Regardless of which solution you end up choosing, it all comes down to dollars and sense. Best way to decide is to perform a comparison on which solution is going to provide the greatest return on investment. The Less time it takes, the more time your managers can spend developing your staff members, spending time on the floor enhancing guest experiences, or driving further profit and growth at your restaurant. Managers are paid to do a job - but what job would you want them doing? One that takes a long time sitting in an office or one that takes little time so they can focus on other ways making the restaurant better. I’m sure you’ve all heard the expression a happy wife = a happy life? Well the same goes for restaurants, but instead of wife, it’s staff. It’s been proven that happy staff members are more engaged, productive and provide a better experience for your guests. The schedule is the root of their happiness. Keep ‘em happy and good things happen! Ameego provides online scheduling solutions to restaurants looking to save time and money managing their workforce. For more information or to speak with one of our representatives, book for your consultation below.